I'm Shelf-ish: Book Blast! 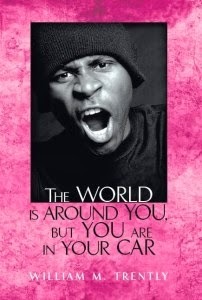 The World is Around You, But You Are in Your Car by William Trently - Win a $25 Amazon Gift Card! Book Blast! The World is Around You, But You Are in Your Car by William Trently - Win a $25 Amazon Gift Card! The World is Around You, but You are in Your Car is a work of fiction wrapped around an essay that describes an American problem—the relentless pursuit of the perfect life—and its negative consequences that adversely affect progress and behavior toward the rest of the world. “I want it, and I want it now,” with its shortage of self-restraint, has been taken to levels not reached before, and the insidious ramifications are eye-opening: the easy disposability of people or principles if these should obstruct the path to the perfect life, the mental depression from the strains of struggling to keep up with neighbors, or the isolation from reality as people become more and more comfortable in their plush living rooms and cars. The tale brings history’s great philosophers together to sound an alarm and talk about ways to slow the relentless pursuit. They discuss the external and internal controls that restrain the pursuit, agreeing that internal control, involving individual self-regulation, is more effective and desired than external control, primarily because of its greater conduciveness to freedom, the crown jewel of this civilization. A handbook of practical philosophy that gives Americans a mission and something higher to live for and a deeper understanding of fundamental ideas which, in turn, make discussions on today’s issues more fruitful. Presented in an easy-to-follow and straightforward language, this book is a wonderfully odd adult fable that makes for a delightful short read for thinking persons and serious students throughout the world. Pump Up Your Book and William are teaming up to give you a chance to win a $25 Amazon Gift Card!